You’re probably a proud New Yorker—who isn’t? But being a New Yorker, unfortunately, does not make you pre-programmed to know the difference between lox and smoked salmon. 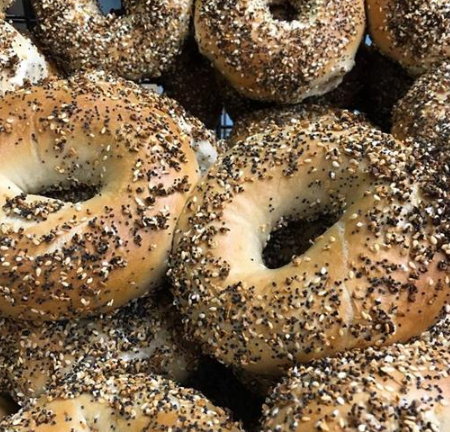 That “bagel and lox” you eat on Sunday mornings… might not be a bagel and lox. Oy gevalt, I know. Deep breaths. Lox—or “belly lox,” which is the actual name for it—is salmon that has been cured in salt. Like gravlax, which is cured in sugar and salt, there’s no smoking involved. It’s the version of preserved salmon people ate before refrigeration was widely available; salmon from the Pacific was hauled across the country in gigantic salt baths and fed to the Jewish immigrants of New York before morning at shul or a long day at work. The taste of true lox is incredibly salty and assertive—bagels and lox were supposedly invented because belly lox needed bread and dairy to cut it. Smoked salmon, on the other hand, is actually smoked; cold-smoked salmon, the stuff that looks like lox, is smoked below 85°F. You might see this salmon labeled as Gaspe Nova, Western Nova, or Scottish salmon. There’s also hot-smoked salmon, or kippered salmon, that’s smoked at 150°F and looks like poached salmon. It’s served in straight up-and-down slices rather than those paper-thin slices, and a completely different texture than its cold-smoked cousin. What’s the Difference is a newsletter created by Brette Warshaw, a consultant and writer living in New York City. She has worked with companies such as RAMONA, OpenTable, LIVELY, Food52, and Open Society, and she was the Chief Operating Officer of the late cult food magazine Lucky Peach. She studied history and creative writing at the University of Pennsylvania, and wrote her thesis on Jell-O marketing in the Great Depression. In her spare time, she enjoys throwing dinner parties and organizing her pantry.